This tutorial explains how to install, configure and use a Regulatory Sequence analysis Tool (RSAT) server installed on a Virtual Machine (VM). To run this tutorial, you first need to install the VirtualBox application. The RSAT virtual machine is distributed in two environments. This environment provides the flexibility of the graphical user interface, but requires more disk space and can be more demanding (memory, CPU) for the host computer. Lighter to install and run, but you can only use VM as Web server, or log in via the Unix terminal (no graphical user interface). Click on the Network option. Click on the tab Host-only Networks. Check if a host-only adapter is already installed. If not, create a new one by clicking the + icon on the right side (snapshot). Double-click on the host-only adapter to change its parameters. In the Adaptor tab, set the parameters as follows (snapshot). In the tab DHCP Server, set the parameters as follows (snapshot). 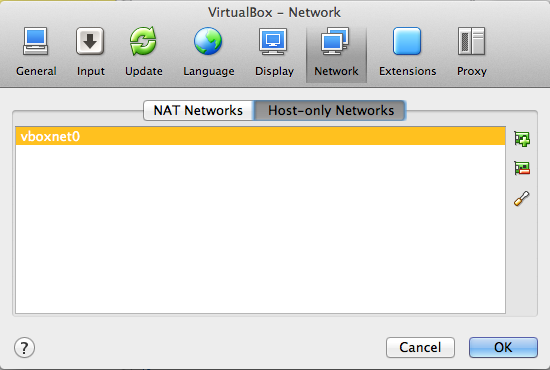 VirtualBox supports various ways to connect the guest (virtual machine) to the network. This solution offers a good tradeoff between security and confort: your virtual machine (the guest) will be accessible only from your computer (the host). In the panel showing the available virtual machines, right-click on the RSAT-VM (rsat-vb-ub14d), open the Settings ... dialog box. 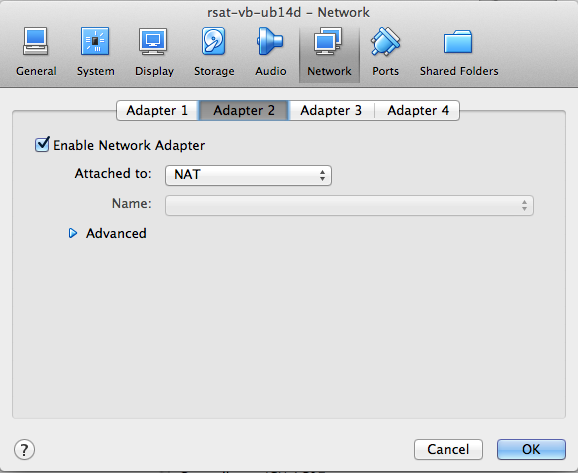 In the tab Network, select Adapter 1, check Enable Network Adapter, select Attached to: Host-only Adapter (snapshot). In the pop-up menu besides the option Name, select vboxnet0. Note: the host-only adapter will enable you to establish a connection (Web browsing, ssh connection) from the hosting operating system (the usual environment of your computer) to the guest system (the virtual machine). however, this adapter does not allow to connect the external world from the guest. In parallel to the host-only adapter, we thus recommend to enable the second adapter and select NAT (snapshot)..
Alternatively , for the sake of flexibility, you might consider to use a bridged network. The bridged adapter is the most convenient, because it establishes a bidirectional connection between your VM (the guest) and the network. Your guest RSAT Web server can thus be used from any other computer in your network. This configuration can typically be usd to make an RSAT server available for all people from the same lab or institute. Attention! The bridged network makes your virtual machine visible for all the other computers of the local network the host machine (your PC). Check with your system administrator that this fits the local security requirements. 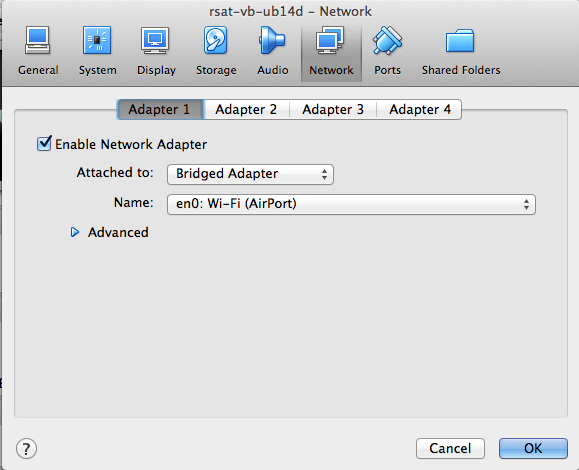 In the tab Network, select Adapter 1, check Enable Network Adapter, select Attached to: Bridge adapter. In the pop-up menu besides the option Name, select an adapter depending on your local network configuration, e.g. Wi-fi (Airport) (snapshot). 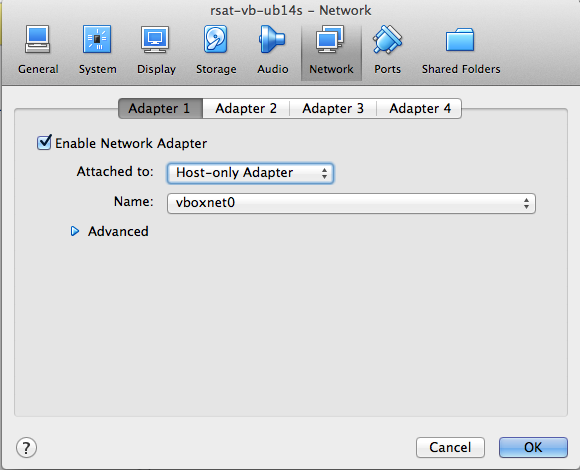 In the left panel of VirtualBox, select the virual machine (rsat-vb-ub14d), and click on the Start icon. At this stage, your RSAT VM should now be ready to be used from the Web interface. Assuming that you activated the host-only network as described abve, and that you only started one virtual machine), VirtualBox hould have assigned the first IP address of the range defined in the settings above: 192.168.56.101. Open a connection to http://192.168.56.101/ in your web browser. If the link does not work, it probably means that your network was not activated as described above. You will then need to obtain the IP address of your VM. Unfortunately, VirtualBox does not provide a direct way to know which IP address has been assigned to a VM. The only way we found to get this information is to log in in the VM, open a terminal, and run the command /sbin/ifconfig. We intently chose an overly simple temporary password to ensure compatibility with AZERTY as well as QUERTY keyboards, but we recommend to use a safer password. At your first login, you will be prompted to change your password before anything else. The user vmuser is sudoer. After login, you can thus become the master of your Virtual Machine, create new users, install packages, etc. A small difficulty when distributing a VM is the large variety of keybords expected to be found on the users' computers. By default, we selected the standard British QWERTY keyboard. 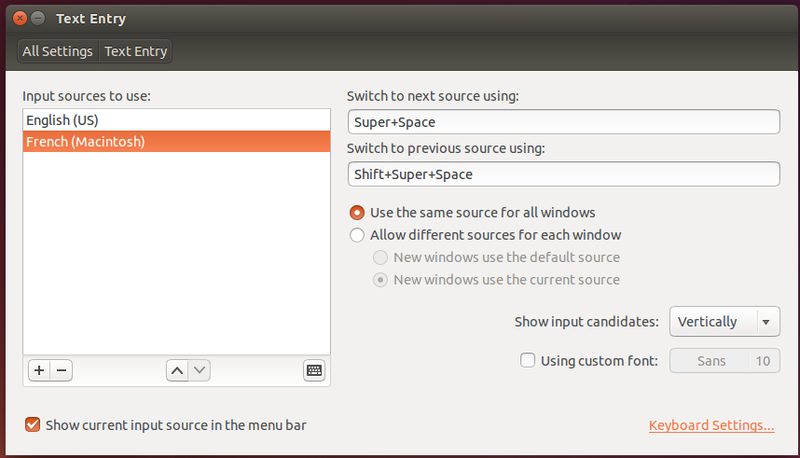 On Ubuntu 14.04 server version, keybord configuration can be modified with following command. For the desktop version, click on the Settings icon , then on the , and check the keyboard..